'Tis the season to be cluttered. As the holiday cards and catalogs begin piling up, you're knee-deep in gifts to be wrapped and decorations to be hung – all while trying to get your home in order for guests. Joy to the world, indeed. Luckily there are clever new storage solutions designed to keep you clutter-free for the holidays and beyond. Someday, perhaps very soon, “snail-mail” correspondence will become obsolete. But until that long-promised day arrives, the tradition of sending holiday cards continues on. 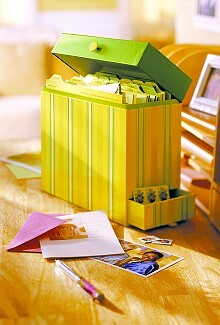 This good-looking Greeting Card Organizer Box holds cards for a year's worth of holidays and special occasions. Pens, stamps and an address book can be stored in a bottom drawer. Cards received and cards to send are prime sources of seasonal and year-round clutter. This is especially true if you're sentimental about saving cards from family and friends, or like to keep on hand a selection of cards to send for every conceivable occasion. One of the best organizing options for card-a-holics is a system that allows you to categorize and store cards vertically. A good example is the Greeting Card Case ($10), a clear plastic container with a tab-lock closure, a carry handle and 12 color-coded tabbed dividers for names, dates or occasions. The case includes both preprinted and blank labels and measures 9-½ inches wide by 5-½ inches deep by 7-½ inches high. Source: The Container Store – in San Diego, the store is adjacent to Fashion Valley mall, phone (619) 220-0909; www.containerstore.com . Greeting Card Organizer Box ($17) – a lidded decorative box (10-½ inches wide by 5 inches deep by 9-¾ inches high) with 18 dividers – one divider for each month of the year and six special occasions – plus a small drawer at the bottom to hold stamps and pens. Source: DaySpring – (800) 944-8000; www.dayspring.com. Rubbermaid's Greeting Card Organizer ($13), an accordion-style system featuring eight pockets for organizing cards and lists, clear tabs for labeling, and Velcro closure tabs. At 11 inches wide by 15 inches deep by 7¾ inches high, this unit is designed to store the most cards. Source: Space Savers – (800) 849-7210; www.spacesavers.com. If you just want to display the holiday cards you receive efficiently, the Christmas Card Holder ($15) is a space-saving stand with decorative coated-wire coils made to hold up to 100 cards. The 24-inch-high steel stand folds flat for off-season storage. Source: Plow & Hearth – (800) 494-7544; www.plowhearth.com. Holiday decorations are delightful to see – except when they haven't been put up in time for the holidays, or if they've been left up long past New Year's Day. To prevent decoration damage and disorder, the Ornament Snap 'N Stack ($25) offers crush-proof, stackable storage for up to 48 ornaments. What appears to be a clear plastic box (12½ inches square by 18 inches high) is actually four separate deep trays that stack and snap together to form one stackable unit with lid and handle. Corrugated dividers are included to create nine or 12 compartments per tray (36 or 48 sections total). Reusable Christmas trees and wreaths are more popular than ever, but storing them can be a challenge. Wheeled Holiday Storage Bags ($139-$159) are an efficient solution for keeping these bulky, awkwardly shaped items protected yet accessible. Recessed wheels and attached straps provide easy toting between house and garage or storage room. The bags are made of heavy-duty polyester/nylon and come in two sizes: the smaller is 36 inches long by 24 inches wide by 24 inches high (holds garlands and take-apart trees; includes removable ornament trays); the large size is 60 inches long by 30 inches wide by 24 inches high (holds 10-to 12-foot take-apart tree or up to five 9-foot garlands). Source: Frontgate – (888) 263-9850; www.frontgate.com. Twinkling holiday lights are a pleasure to see but can be a pain to hang, remove and store. This is especially true when snarled light strings and broken bulbs cause decorating delays and frustration. The Wrap-n-Roll Holiday Lights Storage System takes the frustration out of decorating with strings of minilights. The reels are available in two sizes from Solutions. The spool-style Wrap-n-Roll Holiday Lights Storage System promises tangle-free storage and claims to cut installation and take-down time by 50 percent. Each of the 8½-inch-diameter plastic reels ($15 for four) holds two 100-bulb icicle or mini-light strands; the zippered nylon storage bag ($8; 11 inches wide by 10 inches diameter) makes the reels easy to store and carry. Source: Solutions – (800) 342-9988; www.solutionscatalog.com. The Gift Packaging Work Station ($100) is a compact combination of storage unit and work surface. At first glance, it appears to be just a long, translucent plastic suitcase (42½ inches long by 20 inches wide by 7 inches high), spacious enough to hold 36 rolls of gift-wrap, yet sized to fit under a bed. But hidden underneath are flip-down steel legs that, unfolded, transform the case into a 30½-inch-high work space. The hinged top features clips to hold a roll of wrap and grid lines to help cut in a straight line. The interior houses a ribbon dispenser and scissors caddy that can be clipped to the side of the station. A storage compartment in the lid holds gift totes, tags and tissue. Ribbons, scissors and other gift-wrapping gear are in easy reach on the Gift Wrap Center from Solutions. The portable table can be stored under a bed when the holidays are over. Source: Solutions (see above) The Container Store carries a very similar product called the Gift Packaging Work Station ($99). The Snap 'N Stack Ribbon Organizer ($15) keeps ribbon supplies tidy, accessible and easy to transport. This clear plastic storage system consists of three stackable, interchangeable modules: two 9-inch-wide by 6½-inch-high by 4 3/8-inch-deep boxes, each with a spindle to hold ribbon spools (up to three 2½-inch-wide, five 1½-inch-wide, or eight 1-inch-wide spools). Spindles are removable, so you can use the boxes for bows and gift tags. Plus there are six ribbon-dispensing slots and a 2 3/8-inch-high tray for scissors, tape and bows. 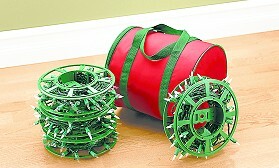 A green lid with a red carry-handle snaps on top of any of the three sections. Source: Improvements Catalog (see above). The Hanging Gift Tote Organizer ($20) offers a streamlined solution for safely storing all sizes of gift bags as well as tags, tissue and other gift-wrapping accessories. A total of 30 clear pockets (18 large and 12 small) cover both sides of the 30-inch-wide by 51-inch-high white vinyl unit, which is attached to a chrome hanger for storage on a closet rod or hook. Source: The Container Store (see above). Harriet Schechter is founder of The Miracle Worker Organizing Service and author of three books, including “Let Go of Clutter” (McGraw-Hill). Her online advice column is at www.MiracleOrganizing.com .